Perhaps more than any other hotel department, the concierge has the ability to turn an ordinary hotel stay into a very special and memorable one. They are destination specialists with a knack for making requests a reality, wishes come true and the impossible possible. Most full-service hotels will have a concierge that will be part of the front office team. 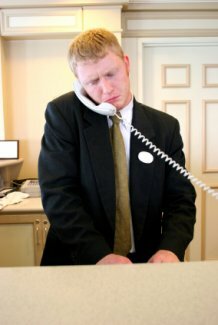 The concierge desk is extremely important to hotel guests as it's considered a trusted resource center for needs that go above and beyond the services offered at the hotel. The requests a concierge may receive are seemingly without boundaries. Whether it's a 7:00 pm dinner reservation at the hottest restaurant, securing a new passport in a day, or obtaining tickets to a sold-out show, concierges work their magic, and connections, to make the requests happen. Concierges are expected to know the destination they represent inside and out. Whether it's visiting museum exhibits, attending gallery openings, dining at the latest restaurant, or partaking in destination activities, the work of a concierge extends beyond their time behind the concierge desk. As they have influence on a guest's decision, concierges are the constant recipients of invitations to experience different things in the hopes they will recommend them. Although there are a lot of perks to being a concierge, it is also a position that requires flawless customer service and the ability to perform under extreme pressure and time constraints. The qualifications to be a concierge will vary depending on the type and quality of the hotel. At a small, mid-level hotel, qualifications may just include a service-oriented personality and an in-depth knowledge of the destination. At a high-end, luxury hotel, many years of proven experience plus memberships into concierge organizations like Les Clefs d'Or may be necessary to even be considered for the position. To find out more about what steps you can take to get started on a path to being a concierge, continue reading on in our Member's Section.